3 All-Star appearances and a National League hitting crown (2011) is a pretty good way for a big leaguer to begin his career. Now, in his sixth season, Chicago Cubs shortstop Starlin Castro has done just that. At only 25-year-old, the Dominican Republic native is in prime position to now be one of the leaders of an emerging Cubs roster, filled with highly touted prospects and an excellent manager. Entering Wednesday, Castro is batting .264, with 5 HR and 35 RBI. 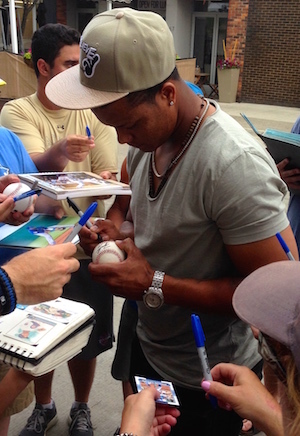 Here is a look at a Starlin Castro autograph signing session, during Chicago's recent visit to Detroit. The original photo is courtesy of iFolloSports.com Michigan correspondent Lance Martinez. Fans can also check out original video of Cubs phenom Kris Bryant signing autographs, amid the very same 2-game set with the Tigers.